Welcome to New England Time Solutions! Lathem's newest edition to its line of proximity time clocks gives users a comprehensive and easy-to-use time clock with a sleek, compact design at an affordable price. 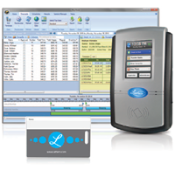 The Lathem PC600 is not thought of as a rugged time clock. This time clock boasts great features and style that make it ideal for indoor office use. It is not a clock recommended for outdoor use or in harsh work environments. This gives the PC600 a low ruggedness rating, as it's not rugged at all, but slightly more durable than time clocks such as the GT550 (which consists mostly of a large touch screen). The automation capabilities of the PC600 include the ability to receive both proximity and PIN punches, record and accumulate employee hours, and an employee messaging system. The PC600 does not offer comprehensive automation for tasks such as job tracking, shop floor automation, or access control. This is simply a time and attendance clock for employee punches and accumulating hours worked. If you're looking for a time clock with the ability to automate job tracking, access control, or other business systems, you should look into more comprehensive networked time clocks. The PC600 should have a great clock life in an indoor setting. It does not have any physical reinforcement, and the outer shell is made of plastic. It does not take wear and tear like manual time clocks, as punches only require a proximity card or scanner and not a typewheel punching cards. Being fairly new, this clock has only been in the field for a year. For this reason, it has not been proven, but we’re confident that it is strong enough to last. This time clock would not survive through mild physical abuse or weather elements, but it will work for years to come in a normal office setting. Ease of use is one of the greatest advantages of proximity time clocks. The PC600 allows for clocking with PIN or the build in proximity reader. This allows employees to punch in with as much as a wave of their Lathem proximity card anywhere around the time clock. The clock itself is touch screen with a very user-friendly windows-based operating system. The menu displays basic options which allow employees to clock in or out, transfer departments, enter tips, and check their total hours. These settings can be enabled or disabled by the administrator. Supply costs for proximity systems are usually less than standalone clocks because you do not need to buy ink ribbons, only time cards. Proximity cards are more expensive than regular time cards, though, and Lathem's badges are priced above average. A pack of 15 Lathem proximity badges sells for about $45. The Lathem PC600 comes new with a package of 15 proximity badges. No additional materials are necessary for use of the Lathem PC600. The PC600 has the capacity to record and calculate hours for 50 employees, which is low compared to most networked time clocks. For this reason, the PC600 is ideal for small to medium sized companies. For large companies, this clock is upgradable to hold up to 1,000 employees. Larger companies will need to seek other solutions. The Lathem PC600 is one of the most stylish and compact time clocks on the market. Mounted to the wall, its sleek design complements any office. The color touch screen makes a much bigger impact than the LCD digital clock of previous models. Centuries ahead of simple mechanical and electronic time clocks in performance and style, The Lathem PC600 is sure to wow employees and employers alike. The PC600 is easily mounted to the wall with three screws. The included mounting template allows you to place the screws in the correct position to mount the terminal with ease. Desk mounting the PC600 is not an option, but wall mounts don't get much easier than this. The Lathem PC600 is a plug and play device. Simply plug it in, and its ready to go. The only set-up required is by the employer, entering the information of the employees who will be in the system. After they are entered, the PC600 will record punches and accumulate their hours on its own. The PC600 is expandable to accommodate up to 1,000 employees. Other than that, this time clock does not offer any extra expandability options, such as bell ringing or access control. When comparing proximity time clocks, the PC600 gives you the best value for the price. The Lathem PC600 gives very simple set up and use, quick, effortless punching, and a sleek design, all for only $499. Contact us to learn more about the PC600 proximity time clock or view more product information including specifications. © New England Time Solutions.